New Jersey's strawberry season is fleeting and ephemeral. Buy them while you can, because with the wacky weather lately, no rain, too much rain, sudden heat, we may not have them around much longer from our "local" farms. A good strawberry should be deep red in colour, plump, sweet smelling and maybe a bit misshapen - don't be fooled by the Plasticine floor show model strawberries trucked in from some far flung place by Driscolls. A truly fresh local strawberry, picked the day before market day (or even better still, the same day) should awaken your senses when you pop in your mouth and burst with lusty juiciness. Usually I want to do nothing more with fresh strawberries than eat them plain, or sprinkle a bit of sugar over them. If I'm feeling extravagant, I may splurge and drizzle a GOOD AGED balsamic vinegar over great strawberries. Once, when I was still teaching at Williams-Sonoma, we used an extremely expensive balsamic that had been opened. We called it our Million Dollar Dessert. Somewhere in my photo archives, I have a picture of my co-worker slurping up the macerated strawberry and balsamic juices, tipping the large mixing bowl back into her mouth. But I digress. 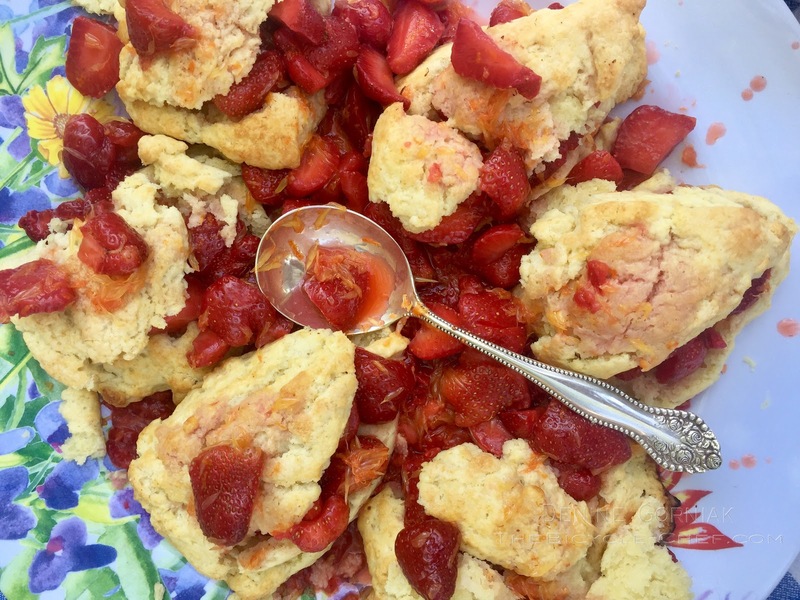 After reading through the newest issue of Milk Street Magazine by Christopher Kimball, I found two recipe ideas for strawberries and biscuits. 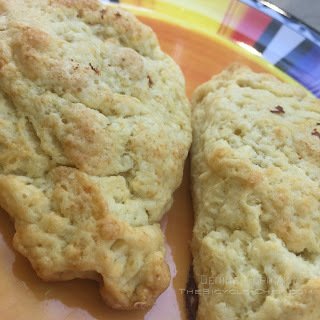 I'll link the biscuit recipe because I didn't tweak it to make it my own - it's perfect the way it is, a cross between a biscuit and a scone. The recipe used the usual butter, flour, sugar, salt, and baking powders/sodas, but it also used heavy whipping cream with sour cream whipped and then folded into the flour mixture. The whipped heavy and sour cream made the biscuits light, tender and airy. The strawberry recipe they used in this issue had lime in it, and that just didn't sound appealing to me. I opted for oranges and because I had a small bottle in the house, Grand Marnier (nice to have a collection of "airplane" bottles of booze around, perfect for when you only need a few tablespoons of the expensive spirits) which I sprinkled about a tablespoon or more over the strawberries to amp up the orange essence. My friend, Cyndi, said that eating the strawberries was like having a party in her mouth, it made her happy! I made the biscuits on Sunday, Mother's Day, for a luncheon we were going to spend with friends. The strawberries were from ATBuzby Farms, picked up in the downpour at the farmers' market on Saturday. The farmer told me that he was lucky to have them because they picked them on Friday. Had he waited to do it any later, he would have been rained out. 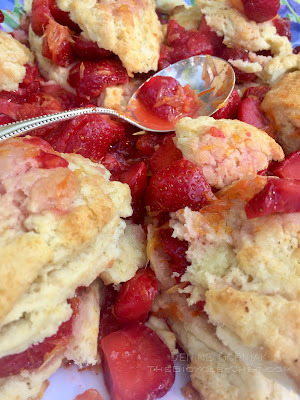 A farmer's season can be fickle, especially when it comes to strawberries. While I was making the biscuits, I macerated the strawberries with sugar, the zest and juice of 4 navel oranges and a tablespoon or so of Grand Marnier. Rinse the strawberries and lightly shake off the excess water. Hull the strawberries, removing the green tops and slice them into half or thirds, depending on how big the strawberries are. Put the sliced strawberries into a large bowl, then sprinkle over the sugar, salt and vanilla extract. Wash the oranges off and dry them. Working over a bowl, zest the oranges and sprinkle the orange zest over the strawberries, folding the strawberries lightly to incorporate all the ingredients. Work on a cutting board and take the zested oranges, and begin cutting away the outer flesh, exposing the orange flesh inside, leaving no white pith on the oranges. Working over a bowl, use a paring knife and follow along the membranes segments of the orange, cutting the orange segments out and leaving the membranes behind. It's like cutting pages out of a book. Squeeze the juice out of the segmented remains and if there is any orange flesh remaining in the cut away outer peel, squeeze the juice from them. Pour the orange segments and accumulated juices over the strawberries, stir to incorporate, then tightly cover the bowl and set aside for one hour or up to 6 hours. The mixture does not need to be refrigerated if you are using it the same day. You want the strawberries at room temperature so they begin to release their juices and not have cold refrigerated air stunt their flavors. If using over short-bread biscuits or whatever cake or biscuits you are serving, spoon some of the strawberry mixture onto a serving platter or in an individual plate. Cut the biscuit open and place the biscuit bottom on top of the strawberries, spooning more strawberries over the biscuit, then spooning more strawberries and juice on top of the biscuit. Add a generous dollop of freshly whipped cream. Serve immediately. Preheat an oven to 475 degrees. Ingredients ares: 2 cups flour, 1 tablespoon sugar, 1/2 teaspoon baking soda, 1 teaspoon baking powder, 1/2 stick chilled unsalted butter cut into pieces. Whisk the dry ingredients together, then cut in the butter pieces to make a coarse meal of the flour. In a mixing bowl, whip together 1 cup heavy whipping cream and 1/2 cup sour cream, to form soft peaks. The fold the whipped cream into the flour mixture, forming a dough. Turn the dough out onto a lightly floured surfaced, and gently knead the mixture to bring the dough together. Form into a round flat mass, cut into half then cut each half into four pieces, flattening the pieces down to less than in inch high. Place onto a lined baking sheet, spacing the biscuits about an inch or more apart. Place into the pre-heated oven and immediately reduce the heat down to 425 degrees. Bake for 15 minutes or until the biscuits are light golden brown, turning the pan half-way in the oven, about half-way through the baking time. Biscuits are best when served the same day, moments after they come out of the oven, but they will hold for a day or two, reheated when ready to serve. As they are so tender, they may break apart when handling, so be gentle with them.